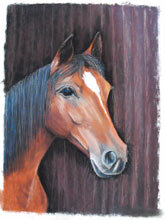 In addition to pastel artwork of Acadia National Park, Ulla is now offering comission work for portraits of horses. 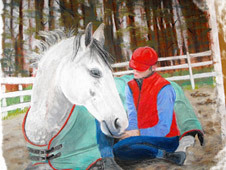 An avid equestrian herself, Ulla has a love for horses and will put her exceptional artistic talent and style into a custom work you will cherish forever. Please call or e-mail directly to discuss your Commissioned work. Cards available in the shop! There is a new selection of cards for purchase in the online shop. These high-quality cards are blank on the inside for your unique message and come with matching envelopes. You will be amazed by the detail and richness of the printed cards. Your friends and family will also be delighted to receive them - especially if they love Acadia. Imagine the cool, fall air on your face as you walk briskly through the woods of Acadia National Park. As you gaze to the right you see great mountains towering high in the morning sky. Brilliant light shines through crisp clouds and playfully shimmers through the autumn leaves onto the path before you. You take a deep breath and taste the fresh ocean air. The world outside the park fades out of your mind as you encounter nature and life as it should be - vibrant and refreshing. This is the world of Acadia that I aspire to reflect through my paintings. While you are here, I hope to share the world of Acadia with you in a new and exciting way. 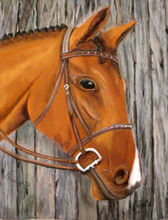 Take some time to look through my growing gallery of artwork. I invite you to take some of my work home with you to share with your friends and family or to display in your home or office. If you have questions or would like more information, please don't hesitate to contact me directly. 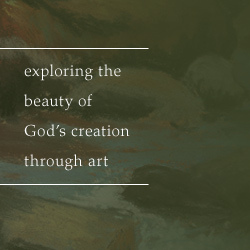 Sign up to receive the latest news about my work, newly available paintings, discounts, and more. The e-mails are infrequent and informative. Each will have a special discount coupon for you to use in the online store. You can subscribe or unsubscribe at any time by simply filling out the form below.